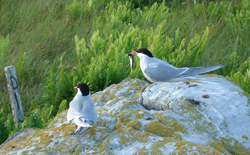 Research has shown that seabirds can function as indicators of changes in marine environments and can be useful as samplers of some commercial fish stocks (e.g. Diamond & Devlin 2003). Therefore, long-term monitoring of seabird movements and prey choices can serve as important indicators of ecosystem change. Our lab is investigating spatial and temporal patterns of diet among marine birds using biochemical markers such as stable isotopes and fatty acids. Shearwater diets at tidal upwellings in the Bay of Fundy. In the Bay of Fundy, where tidal amplitudes are among the largest in the world, flooding and ebbing tidal currents form strong and predictable upwelling regions where seabirds and marine mammals forage. Greater (Puffinus gravis) and Sooty shearwaters (P. griseus) make heavy use of these upwelling systems. 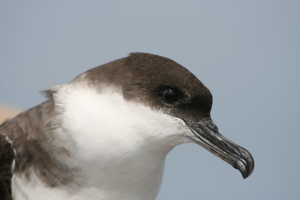 Since 2005, Rob has captured and sampled (blood and feathers) over 200 shearwaters for dietary analysis. Preliminary analysis shows krill and herring to be important prey for shearwaters staging before long distance migrations. Monitoring of shearwater diets may serve as indicators of herring stocks which form a vital economic role in the Grand Manan community. In many parts of the world, ongoing changes in marine fish communities have led to changes in predator communities at higher trophic levels. The collapse of groundfish stocks in the northwest Atlantic has probably induced such a phenomenon. Using feather samples from museum specimens and diet samples from contemporary sampling, Bob and Marty showed how feeding patterns have changed over the long-term for a resident, generalist gull (L.marinus).